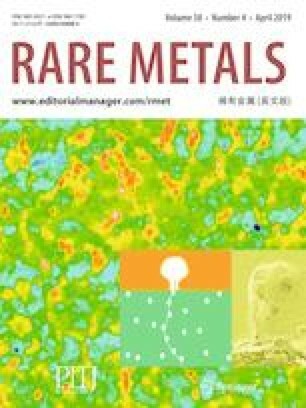 Microstructure evolution and properties of a Cu–Cr–Ag alloy during the continuous manufacturing process were investigated in detail by scanning electron microscopy (SEM) and transmission electron microscopy (TEM) in the study. The Cu–Cr–Ag alloy rod with uniform compositions is fabricated by upward continuous casting technology. Few of the Cr phases are observed in the as-cast alloy. During the continuous extrusion process, the severe shear deformation and the dynamic aging occur. The average grain size of as-extruded alloy is much smaller than that of as-cast alloy. Both fcc and bcc Cr precipitates appear in the matrix. The interaction mode between dislocations and precipitates can be identified as Orowan bypass mode according to the TEM observations. The overall difference in the yield strength between as-cast and as-extruded Cu–Cr–Ag alloy is attributed to solid solution strengthening, grain refinement strengthening, precipitation hardening and working hardening. This study was financially supported by the National Key R&D Program of China (No. 2016YFB0301400) and the National Natural Science Foundation of China (No. 51601017).